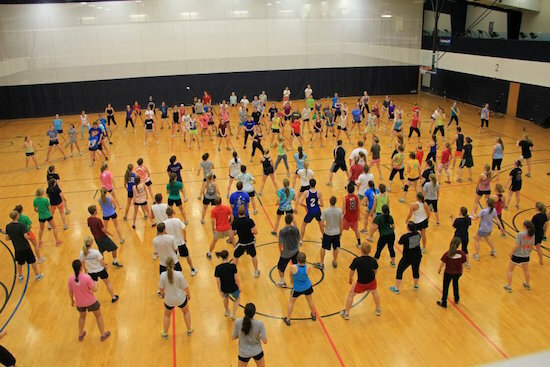 Students participate in a Zumba class in Hitchcock Arena. Photo from the Messiah Zumba Facebook page. The health and physical fitness general education requirement will change for incoming and transfer students this fall. The requirement currently consists of a two-credit introduction to wellness class and a one-credit activity course. This fall, new students will only take a one-credit activity/wellness course that combines the two classes. The change from a three credit requirement to one means the QuEST general education curriculum will now decrease from 56 credits to 54 for new students. The new Director of Student Wellness, Mindy Smith, is quick to point out that the one credit distinction does not mean less work. It is simply a more streamlined and integrated course, she says. The new courses will meet three days a week instead of two in order to meet the national recommended amount of physical activity per week. There will be many different classes offered throughout the year such as pilates, couch to 5k, fitness walking, disc activities, strength training, and more. Smith said the classes are designed to be lifestyle oriented. She hopes students will connect with a certain class and continue the activity through college and beyond. While each class offers a different activity, there are some consistencies. Every student enrolled in a wellness/activity class will be required to attend at least two wellness seminars a semester from 7-8 p.m. The seminar topics will address common wellness topics such as heart health, body image, nutrition, stress, sleep, and more. “After we get this structure running, part of my hope with my position is to continue to connect with different departments and organizations on campus to try to meet needs and be able to run effective initiatives throughout the time students are on campus,” Smith says. In addition to attending the seminars, students enrolled in the classes must complete a pre and post-semester wellness survey. The confidential survey will help students identify goals and follow their progress throughout a semester. Various fitness assessments throughout the course will help students track their improvement. Smith’s hope is the increased number of classes and seminars will lead to more discussion and assessment time. “We’re trying to use some of our extra time to engage in discussion. There might be certain classes where we do a shorter exercise period and provide some time to do some of these assessments and discussions or some goal setting,” she says. Upper-class students may also experience these aspects of the new program. Returning students who have not yet taken an activity course will enroll in the new one credit wellness/activity course to fulfill that requirement. Intro to wellness will still be offered for returning students who have not yet taken that class. Student athletes will also feel the changes. While student athletes will be exempt from the exercising portion of the class, they must complete the assessments and attend two seminars. Assistant Dean of General Education and Common Learning, Robin Lauermann, hopes the new classes will positively impact the students enrolled. “I really hope it gets students thinking about the idea of wellness as something that’s a lifelong activity. Wellness has an inherent relationship to all else we’re going to do. If we’re not well enough in mind, body, experience, it shapes all we’re going to do in our professional and personal lives,” she says. Look for a variety of the new courses at different times in both the fall and spring semester.